As one of the most distinctive features on perhaps the most famous (and most imitated) guitars ever, the floating tremolo system as found on the Fender Stratocaster (and other guitars like it) is one of the most-played hardware systems out there. The system allows players to create natural, fluttering vibrato, akin to what early jazz and blues players were doing on their arch tops by pushing and pulling on the tailpiece. Floating tremolos aren’t for everyone though, and many players through the years have opted to “lock down” their bridges, including, Eric Clapton, who had his favorite Strat, “Blackie” set up to have a hardtail (non-tremolo) bridge. 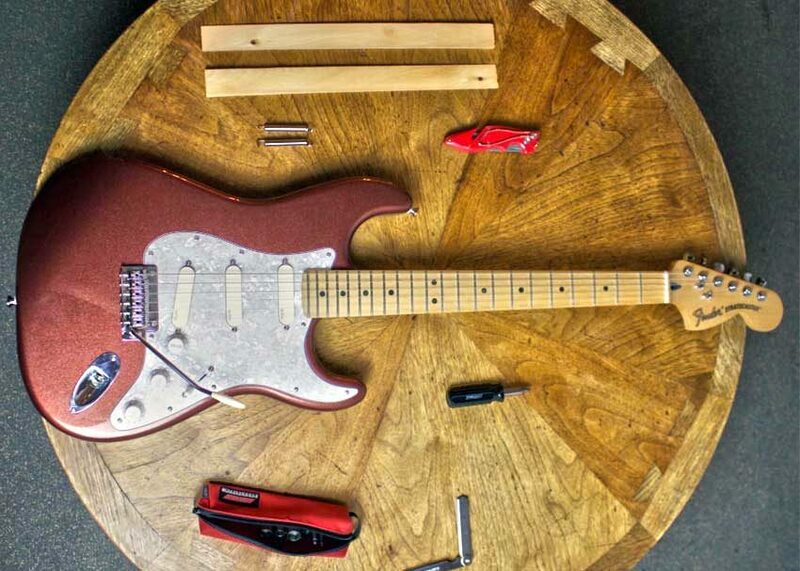 There are two main methods to convert a Stratocaster with a floating tremolo bridge to a hardtail Stratocaster. One involves “blocking” the bridge by wedging a wood block between the trem system and the body of the guitar. The other is to “deck” the tremolo by adding extra springs and tightening the spring claw to deck the bridge against the body. Both effectively do the same thing, but just like everything else with guitars, players will passionately debate the benefits of one over the other. The hunt for pure tone is unending, but we’ll go through a few simple and quick ways to both block and deck your floating tremolo. To start, get your guitar set up how you want it and playing well if it’s not already. Put on the gauge of strings you prefer and tune up to whatever tuning you want the guitar to be in. Sure, you may need to do a bit of intonation work after you block your trem, but if you start off with a guitar that’s all out of whack you’ll only cause more headaches for yourself. For this guide, I am using a Fender Deluxe Roadhouse Stratocaster that we have hanging around here in the office. You may recognize it from our Legends of Tone: David Gilmour video — hence the EMG Gilmour pickup set. 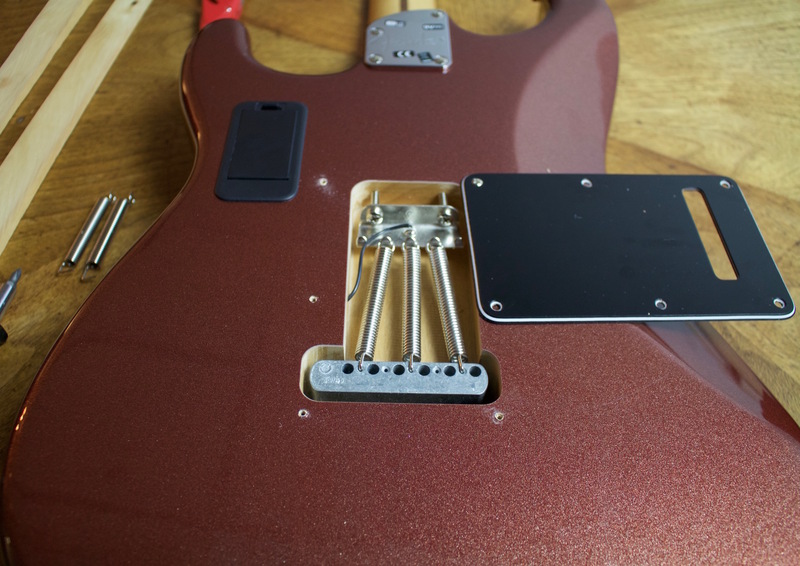 This goes without saying, but first you need to take the back plate off so you can access the tremolo system. The Strat I’m working with is set up with three springs, which is common for most floating tremolos. Take that cover off ya dingus! Measure the distance between the spring block and the the back of the body cavity. This will tell you how big of a wood block you need. Take your piece of wood and cut out a small block to fit your measurement. In this case, the gap was pretty close to the size of the thickest end of the wood shim. Now, this is the part where the comments section will come alive: everyone has a different opinion on what your block should be. Some say any scrap wood is fine. 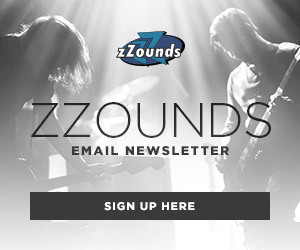 Other purists demand that you use a solid piece of tonewood. I’ve even seen people mill blocks of aluminum for this, claiming it is the only true way to enter the gates of the #tonezone. I personally am of the opinion that, for the most part, not a whole lot of your tone lies in the wood of your guitar. I have glued together wood shims that I got from the hardware store and have had good results. I would just recommend using a hardwood for the block. Another very common method that will pop up if you do some searching is to use some spare change. Some people have even put out videos with clever titles like “Blocking Your Trem for $1.75” and the like.I personally have never done it, but from what people have said, some spare change wrapped up in scotch tape works fine. For now, I have plenty of wood shims available. If need be, use some sandpaper to sand down your wood block until it snuggly fits in the cavity between the body and the spring block. In this case, I got lucky and the thick end of the shim was pretty much perfect. I didn’t need any more adjustments. Loosen the two screws on the spring claw by a quarter to a half turn. This will move the spring block back slightly and wedge the block in nice and tight. 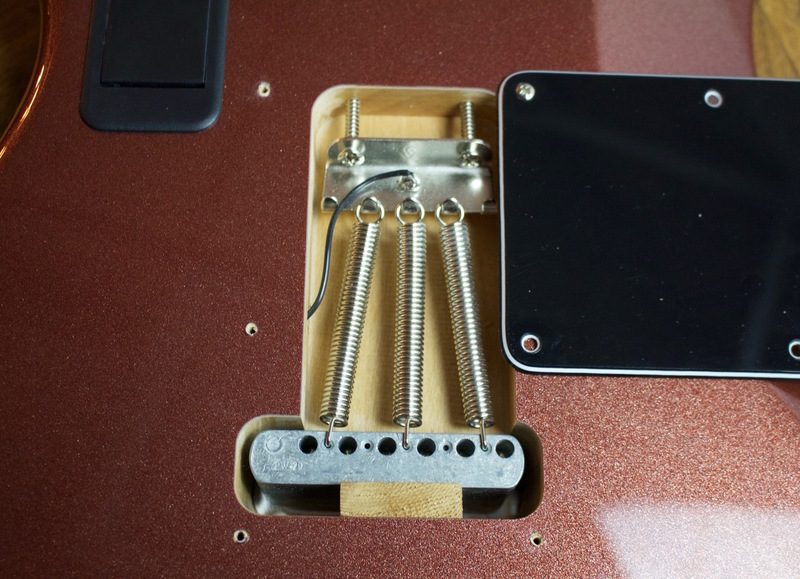 Being that it’s only a very minor change, it shouldn’t affect your bridge’s set position much. There should still be a good amount of tension on the springs. In this setup, you can still pull up on the bar, but it will will not dive and downtune your strings. 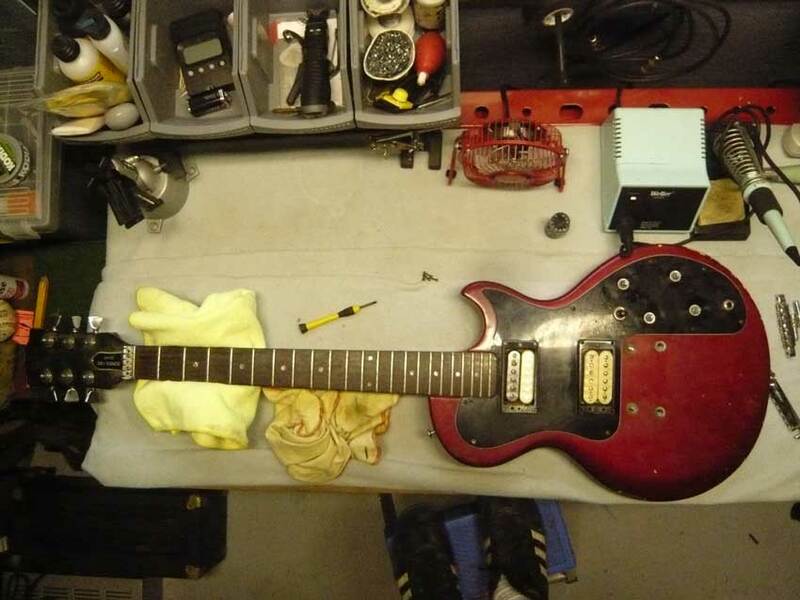 With the tremolo bar off, you really won’t end up pushing back on the bridge much. For most people (myself included) this is enough, but some players want a 100% set bridge. 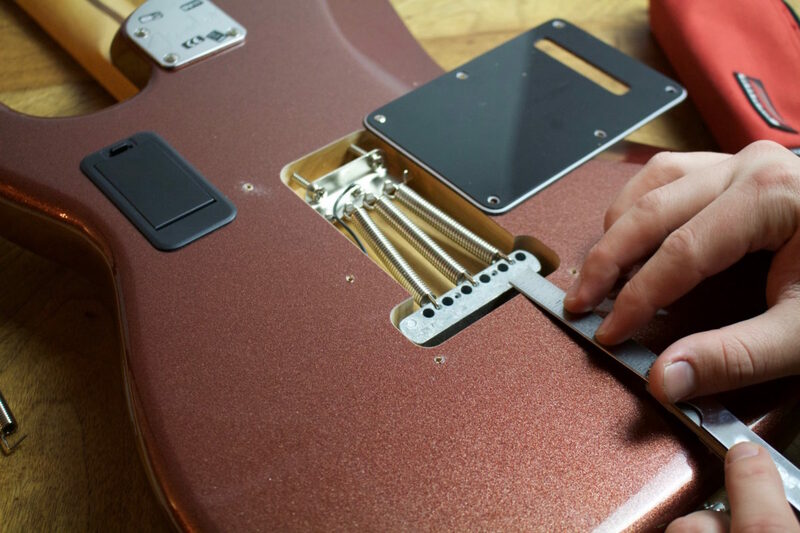 If you decided to drop tune your guitar, the trem can still move forward and cause an issue. To compensate for that, you can just remove the middle spring and slide in a second, smaller wood block between the spring block and the front of the cavity to lock it down in this direction as well. If you think you may want to de-block your guitar at some point, a nifty little trick is to drill a hole or two into the block. This way, you can insert something in the hole to get a fulcrum to wedge the block out, or use the hole as a guide to drill a screw in, and then grab said screw with pliers and pull it out. This is especially helpful when you put blocks on both ends of the spring block, as you can’t push your bridge back to un-wedge the block. After that, you’re pretty much done. Tune your guitar, play a bit and see how it feels. There shouldn’t be too much change, but you may have to adjust a string saddle or two to get your action back to where you want it. You guessed it, take the plate off the back of your guitar. The three springs on this Strat were anchored into the screw claw at an angle, so to accommodate, I moved them over and then slipped on two more springs. Tighten down the screw claw to add extra tension on the springs. This will make sure the trem is decked down against the body nice and tight. Start with a turn or two, tune up the guitar and then play it and feel it out. If you feel you need some more tension, flip the guitar back over and repeat. Just be careful you don’t over tighten it. Decking the tremolo isn’t as ideal on a two-point tremolo system, as these are usually set so that the contact point of the bridge rests a few centimeters off the body. 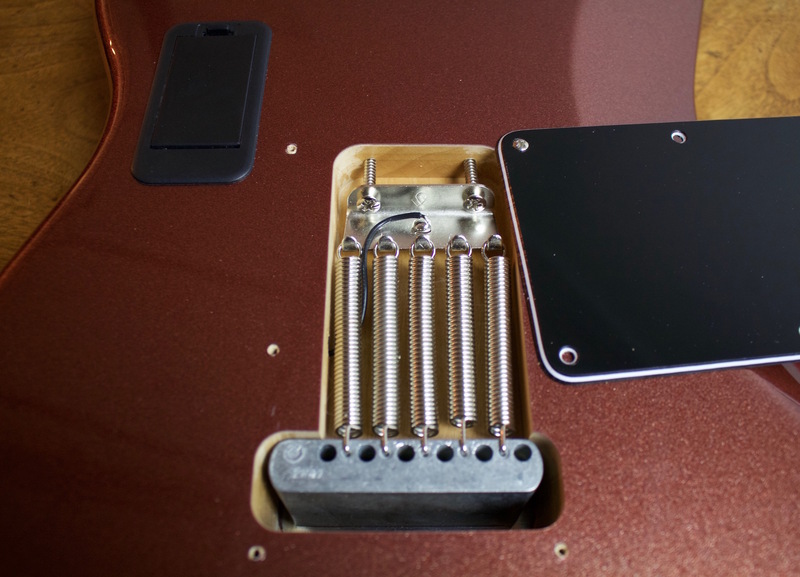 With the trem pulled back to the body, the plate will sit back at an awkward angle. To compensate, lower the bridge posts so that the entire bridge plate sits flush onto the body. 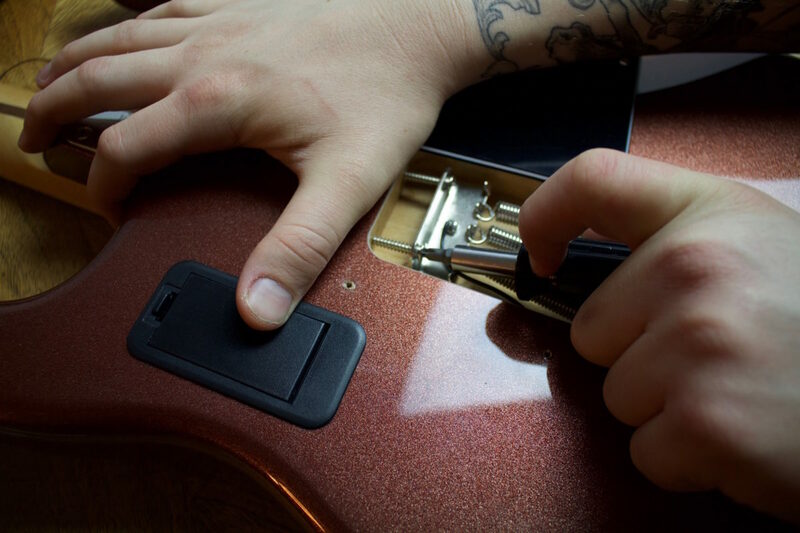 The only issue here is that doing this will throw off the intonation of your guitar a bit, so some saddle, neck and other adjustments may also be necessary. The guitar I have features a two-point system, but it was already lowered down pretty close to the body. NOTE: you can also block a Floyd Rose-style tremolo with pretty much the same method. Finally, you can install a hipshot tremsetter. 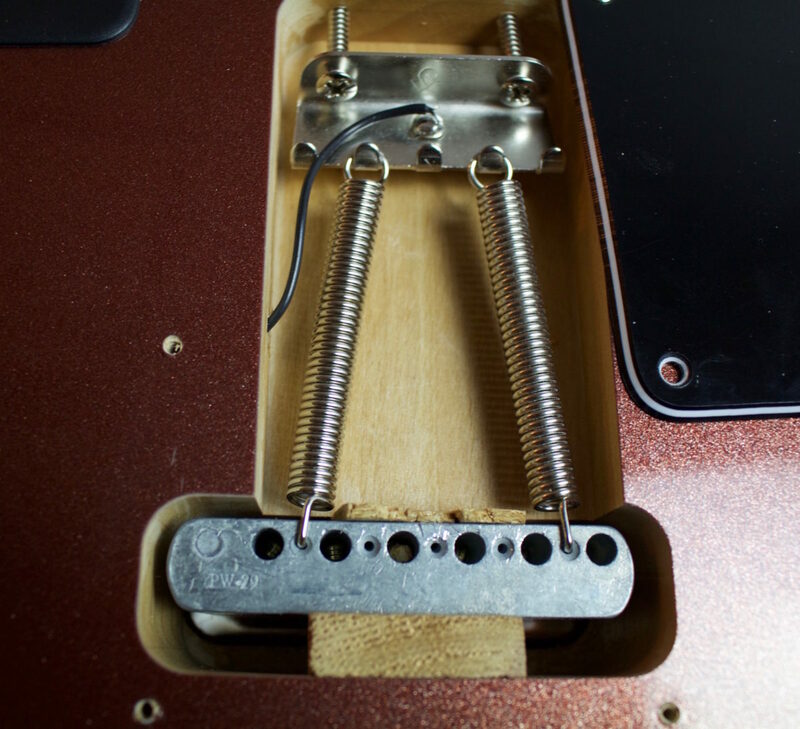 Sitting in place of one of your springs, the Tremsetter counteracts the action of your springs and string tension’s interplay to keep your tremolo in place. You can still get the full action of your tremolo, but the Tremsetter will eliminate any tuning and tremolo flutter problem. Their website features a very in-depth video on how to install this system. And there you have it — your Strat is now a hardtail! If at ever you decide to go back to the wild and wonderful world of floating trems, undoing your decking or blocking work is easy. I’ve been doing just that for thirty plus years. If you prefer the backplate installed, use five springs and (typically) the block will still be positioned to allow string changes without removing the backplate. 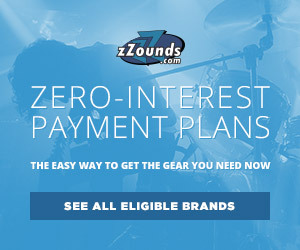 Another option = Buy a hardtail Strat! Hey Cole, the spring method is my preferred way of decking a strat as well. Tons of other plays prefer the blocking method though so I figured it was best to cover every method I could and cover all the bases. As far as just buying a hardtail strat, that is for sure the best option, but sometimes you find a deal on a trem strat you just cant pass up, or in my case, through a cascading series of old practice spaces, flakey band mates, and left behind gear, a strat just falls in your lap. Real question. Why wouldn’t you just screw the thing tight to the guitar body? What part is it exactly that you are referring to?